Charlotte Gainsbourg is in no rush. Her latest, Rest, is only the singer and actresses’ fourth album in 20 years. Composed over a long, six-year stretch that found Gainsbourg moving to New York and processing the death of her sister, Kate Berry, who died in 2013, the album both memorializes the lost and embraces those who are still here. Working with producer SebastiAn, and collaborators like Owen Pallett, Connan Mockasin, Guy-Manuel de Homem-Christo of Daft Punk, and Paul McCartney, the record marries pulsing electronic disco and personal confession. It marks the first time Gainsbourg has largely penned the lyrics herself, and tellingly, it feels like her most accomplished and intimate work to date. AD caught up with Gainsbourg from New York to discuss the album’s genesis and stepping behind the camera as a director for the first time. Aquarium Drunkard: You worked on Rest over the course of a few years. Did you have a sense of ease about it? Charlotte Gainsbourg: I felt comfortable. I felt that what I wanted to say [was] “I’ve got the voice I have.” Of course, I was trying to push myself, because that’s always a goal. I was trying to surprise myself, but not trying to be someone else. AD: When I learned about how much death and loss informed the lyrics of this record, I was prepared for it to be sort of a solemn, quiet album. But it’s not that at all. Did that contrast surprise you? Charlotte Gainsbourg: Well, first of all, I didn’t start the record mourning. I wasn’t in that spirit because my sister was still alive. I started [by thinking] about subjects that were dear to me. Missing my father was part of that already. I knew I wanted to have electronic music as part of the record. What I was hoping for was to mix my voice — [one] that’s not very strong — with very strong music and to see if the combination would work. And when my sister died, I was compelled to write about her and only about her. But I didn’t want the music to be suddenly sad. In order to be very personal and intimate, I needed something to give me a bit of a distance. I felt that through the music and the fact that it was so energized. And at the same time, it was part of the mourning and the grieving. That was what SebastiAn thought of from the very start, and that’s why I asked him to come work on the album with me in New York. The decision to come here was, for me, a decision to be alive, to feel alive, which was not what I felt in France because it was too heavy to deal with my life before and the fact she wasn’t there. AD: There’s a contrast in the title. There’s “Rest,” which is what we’ll say in English about someone passing away, and then the French “reste,” which as I understand it means “stay.” Was the contrast apparent in those two meanings of the word something that you thought of early on? Or did that reveal itself as you figured the songs out? Charlotte Gainsbourg: I still feel very uncomfortable with my own titles because I lived with SebastiAn’s [temporary] titles for a very long time. Each time he would compose a song, he would give it a title that made sense to him. [Not based on] lyrics — it just made sense because, you know, it’s what he was watching on TV or there was something he thought of while he was composing. To give a title is to really put the emphasis on something and I didn’t want to do that. The only title I was able to give was the song that I did with Guy-Manuel [de Homem-Christo] and that one I called “Rest” straight away. It sort of made complete sense to play with those languages and to address my sister, saying, you know, “stay” and “rest in peace.” So that was the only title I would not feel embarrassed about or that I felt comfortable with. Picking one title for the whole album, I went back to that first song because it was just obvious. AD: You directed the videos for this album for the first time. You’ve had a storied acting career. How did your experiences in film influence the way you directed others? Did you find wind up putting yourself in their shoes from behind the camera? Charlotte Gainsbourg: I did when it was my son. My son was in the video called “Ring-a-Ring o’ Roses.” It was incredible to have that relationship him, to be able to look at him and to see him as an actor and to be quite emotional with that process, because it meant a lot for me. And I could see that he wanted to serve me the best he could, and he really was very, very sweet and generous about it. But then, the economy of a music video is so small that you can’t really take the time to do anything. You don’t really go in depth into takes and takes of one shot, you know. You sort of try and grab as much footage as you can. And then things happen in the editing room, so I can’t really say that I’ve experienced real directing. AD: Do you want to do that? Charlotte Gainsbourg: I think I would love to. It would have to be, I guess, something personal enough that I would feel legitimate to tell as a story, you know? But at the same time, I don’t want to write myself. And I don’t want it to be just a mirror of [my life]…it’s not like an album. I wouldn’t do the same thing. But it has to resonate in a very personal way, I guess. AD: You wrote most of the lyrics for this yourself, which was a new process for you. What did that writing teach you about yourself? Charlotte Gainsbourg: I was always shy about any word that came out from me. I remember when I was first working with Beck, he would encourage me to write as much as possible so that [IRM] album would feel personal and intimate. Even if he ended up writing the whole thing, I still came up with ideas. But I felt so embarrassed with my own words and not feeling that I was a poet in any way. With English, I’m not that fluent, so it’s always been harder. And the French was even harder because I had the weight of my father on my shoulders, because he’s been a genius at writing, and I’ve been brought up with his words and his…everything about him, which meant that I couldn’t step into those shoes. It was impossible. [But] after my sister died, it didn’t matter anymore. It didn’t matter if I was good enough or if I was going to be proud or not. It just had to come out, not as a therapy, but just – that’s what I wanted to say, and I didn’t care if I was saying it with the right words or artistically enough. I didn’t care. That’s what changed, is that I was able not to care. AD: It sounds like there was a lot of freedom in that for you. Had you not felt that as much before? Charlotte Gainsbourg: I think that, because I was in New York, that gave me a freedom that I completely discovered. I came here to, you know, to flee from Paris and my old life. I discovered what it was like not to be recognized in the streets, to be able to take my children to school and not be looked at. I didn’t really think about it before. And I think in the whole process of writing the lyrics and not judging myself, I think that had to do with it because I wasn’t feeling – I think if I had written in France, I would’ve felt that I needed to hide. Whereas here, I was able to go to the studio and just show my lyrics to SebastiAn and feel very free about it. The people are very sweet in France, you know? I’m not saying I needed to run away from a terrible place, But I feel that everybody knows who I am – they know my doubts. Whereas here, I was starting from scratch. AD: You have a lot of strong collaborators on this record: SebastiAn, Owen Pallett, Connan Mockasin. But also, you’ve got Paul McCartney on your record. I understand that he gave you that song, “Songbird in a Cage,” something like six years ago? 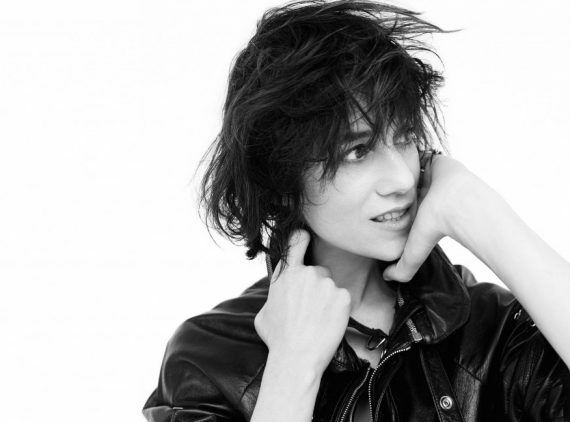 Charlotte Gainsbourg: For so long? AD: – and not put it into the world? I imagine if it were me, I would be in a rush to get that into the world. Charlotte Gainsbourg: I had to wait until I knew exactly what album I was making [and work with] SebastiAn [so he] could portray it in a way that would make it feel honest. The whole feel of the album was quite specific. AD: I love the idea that you needed to have this album become its own thing, and that meant if a McCartney song had to wait a while, it waited. You wanted to get it right.